Was a Soviet film director and film theorist, a pioneer in the theory and practice of montage. He is noted in particular for his silent films Strike (1925), Battleship Potemkin (1925) and October (1928), as well as the historical epics Alexander Nevsky (1938) and Ivan the Terrible (1944, 1958). 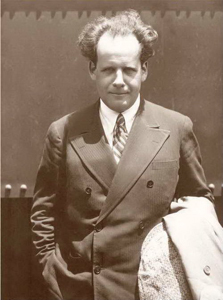 Eisenstein was born to a middle-class family in Riga, Latvia (then part of the Russian Empire in the Governorate of Livonia), but his family moved frequently in his early years, as Eisenstein continued to do throughout his life. His father, Mikhail Osipovich Eisenstein was born to a German Jewish father who had converted to Christianity, Osip Eisenstein, and a mother of Swedishdescent. His mother, Julia Ivanovna Konetskaya, was from a Russian Orthodox family. According to other sources, both of his paternal grandparents were of Baltic German descent. His father was an architect and his mother was the daughter of a prosperous merchant. Julia left Riga the same year as the Russian Revolution of 1905, taking Sergei with her to St. Petersburg. Her son would return at times to see his father, who joined them around 1910. Divorce followed and Julia left the family to live in France. Eisenstein was raised as an Orthodox Christian, but became an atheist later on. At the Petrograd Institute of Civil Engineering, Sergei studied architecture and engineering, the profession of his father. In 1918 Sergei left school and joined the Red Army to serve the Bolshevik Revolution, although his father Mikhail supported the opposite side. This brought his father to Germany after the defeat of the Tsarist government, and Sergei to Petrograd, Vologda, and Dvinsk. In 1920, Sergei was transferred to a command position in Minsk, after success providing propaganda for the October Revolution. At this time, he was exposed to Kabuki theatre and studied Japanese, learning some 300 kanji characters, which he cited as an influence on his pictorial development. These studies would lead him to travel to Japan.